Remaking a quilt can be fun - especially if you still have the original fabrics. 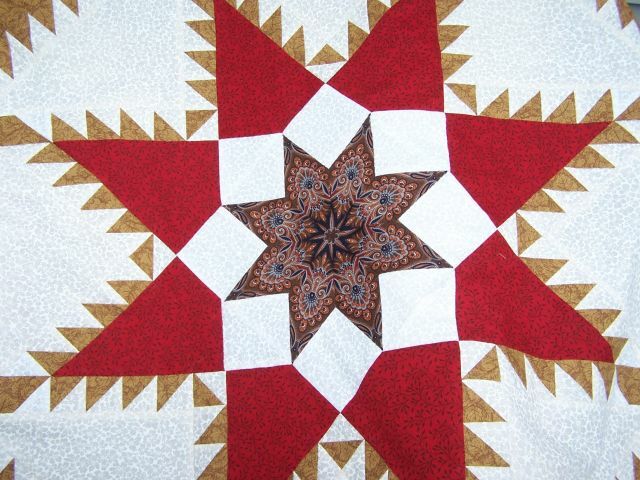 "Paramount Stars" a pattern designed by Mary K. Ryan of VT is a beautiful quilt. I made the 96" square quilt for my brother and sister in law for their wedding present 15 years ago. It has been on their bed ever since and is just about worn out. The colors are faded so it is hard to see the colors or pattern. It's been washed so much it is fragile and torn in places with batting coming out in others. It is actually so good to know something I made has been loved and used so much. SIL asked if I could repair the quilt. After discussions with local friend quilters the decision is basically no way. However - I loved the fabrics used in it obviously since I still have some! My sewing room is bright but gets no direct sun and the fabrics are sorted in large light proof tubs. The colors are bright and look new. I've already remade the center star and working on the first feathered border. I won't be making the whole quilt again but a laptop size. My hand quilting days are gone, so this will be machine quilted and hopefully good for another 15 years. 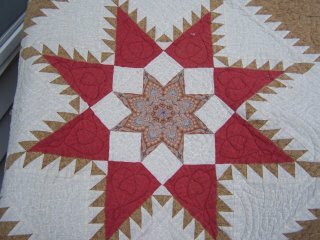 Photos show old faded quilt and new center pieced but not quilted yet. Anne, What a beautiful quilt. You have many talents!